Good one...the sail and the photo. You would have to be more than happy in averaging 4 kn given light the winds. Very happy. I had prolonged spells where the boat speed was near five knots, and a couple of times it accelerated up past five. I was ready to head back home when the wind died right off during the outwards leg but I figured I'd see how far I'd get in three hours, and the wind came good after a while. So we did dead running, broad reaching, shy reaching, but no true beam reach and nothing hard on the nose either. We did several jybes and went about on both tacks. All behaviours normal. OK you can all stop clamouring. Here's your video. Ignore the grubby bits, the incorrect yard haul point, etc etc and enjoy. I just checked the bureau and the wind speed got up to 10-15 knots for a little while, and was in the vicinity of 8-12 for a bit longer, so that explains the good boat speed. That's pretty damn good for such a modest waterline. Five kn must be on the verge of planing. She defs won't plane with that hull shape and a belly full of water ballast but other owners have reported boat speeds that seem too high for the wl length. Very satisfying to get her choofing along at this stage while I'm still sorting out the rig and learning how to sail a lugger. I'll need all the advantages I can get for the next levels of use - camp cruising at an indecent distance away. I should keep my trap shut but I'm in light hearted early discussions about sailing to Tas alongside a 30 footer. Probably two years down the track, or more likely never, but I like the game. Back to reality, I'm busy refurbishing the batteries in the electrical system. I let the li-ion cells run right down and I may have trashed a few by doing that. Anyway, i managed to kick start a charge on the whole 24 cells that make up the pack so maybe I'll get away with it. I'll need lights and charging power for the next adventures. I'm stuck at home again for another week having volunteered to look after a dog while the owners are away. I've done a couple of very trivial jobs, but Romana is well ready to take the next leap. Weather permitting it looks like being a gulf crossing overnighter to Sheoak Flat Beach. 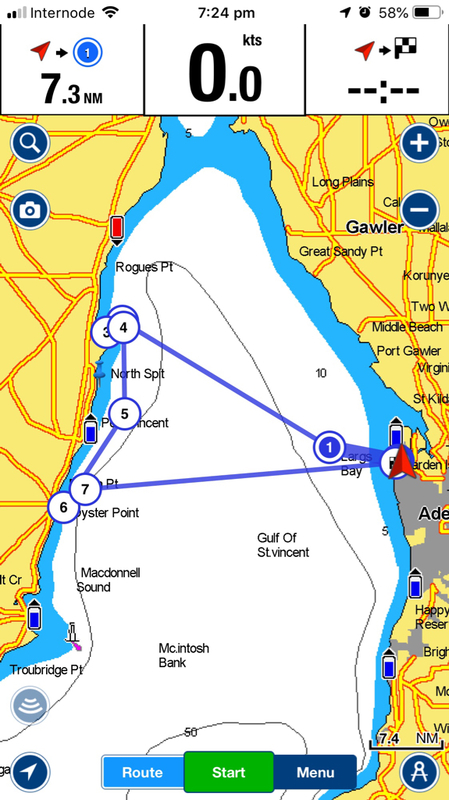 Subject to surviving a simple overnighter the next stage looks like being a two nighter triangle across the gulf to Black Point, Stansbury and return. Now to one of my recurring favourite topics - self steering. Yes, I know I've already done this to death but Romana hasn't got a self steering thing yet so I'm going to make one. It will be an experiment in three stages. 1. make a wind blade 260mm chord x 900mm span out of scraps. NACA-0012 profile. Mount it aft and above the stern of the boat on the centreline, with a crank that moves thin dyneema chord in response to the blade tilting. Take the dyneema chords direct to the tiller and see if there's enough force to steer the boat. 2. if the force on the blade is not sufficient to steer direct to the ship's tiller take the dyneema lines direct to a retractable kayak rudder mounted on the port side of the transom (away from the off-centreboard wake) and see if there's enough force to steer the boat by the kayak rudder. 3. if the force on the blade is not sufficient to steer direct to the kayak rudder, as 2, but pivot the rudder through a longitudinal pin and use the swing of the rudder in the ship's wake to provide a strong force to two lines back to the tiller. I have the kayak rudder and the support frame for the blade mechanism. I've printed a template for the NACA-0012 foil shape and I'll make the blade. Last edited by brucemoffatt; 04-14-2019 at 11:55 PM. What I meant to say is Good luck, sounds like a fun project. 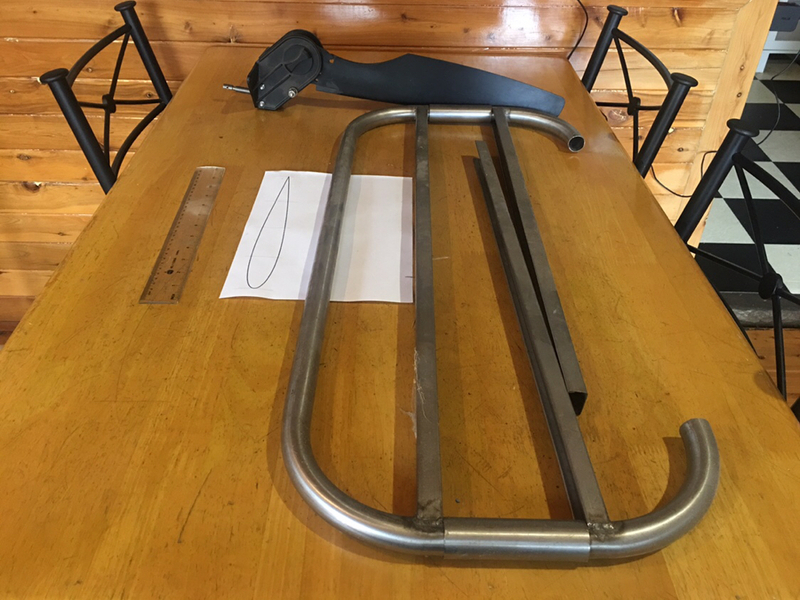 Thanks, and you raised a very good question in the previous post, why the smaller kayak rudder might work in the possible outcome where the main rudder didn't. There are two modes of force at play. Going upwind with no self steering weather helm applies tiller force that the steers-person counteracts by pulling the tiller to windward against that force. If the tiller is lashed with a bungee you can sometimes get the forces to balance out and the boat will hold course. The shorter the effective keel length the harder that is to achieve. But putting a tiller tamer bungee across the cockpit through a clutch on the tiller allows a reasonable head start to balanced upwind steering, especially with a bit of bias to balance against weather helm. If a small balanced rudder is added in, there is not much force required to fine tune directional control. Going downwind there is much less tiller force however with wave action to counteract the stern will want to slew and waltz. The main rudder can act as a dampener to that slewing if it is held close to a neutral position, but a bit of 'give' should be included. So again a bungee tiller tamer across the cockpit, with a clutch on the tiller, will help in that regard. A small balanced rudder will then not be required to do a lot of the work to trim the directional control. At least, that's my take on it. It may not work at all, but in theory it should come close to it. If not then option three almost certainly will do it. Have you tried the bungy cord steering method? Not yet. I have the strings and bungees and blocks all set up somewhere but I forgot I'd done that until you reminded me. I guess I should try them first. Definitely worth playing with the bungee method. Every boat is different. My paradox turned out to be excellent at self steering using lackeys only on any point of sail. One of the tricks to getting her steady down wind was to keep her a little under hull speed. Haven't sailed my new boat enough yet to know what she can do but I am hoping to avoid anything complicated. Back in my folkboat days a Navik did all the work for me reasonably effectively, but it was a complex thing with parts I could not easily repair and so was a source of worry. If the bungee method works for you, it really is much nicer than a vane just because it is so simple and easy on the budget. A vane is just too much for a Scamp. But on a bigger boat, a well-set-up vane is a joy, representing the peak of human engineering. Last edited by RFNK; 04-15-2019 at 06:37 PM. I’ve gotten as far as buying the bungee cords. A vane is just too much for a Scamp. But on a bigger boat, a well-set-up vane is a joy, representing the peak of Hyman engineering. Any trip longer than a couple of hours requires some effective self steering, if only so a coffee can be poured and a leak can be taken. Whatever works, works. Before figuring out how to get my paradox sailing herself I simply loaded her up with a few weeks provisions and off we went. Once well out to sea necessity caused the self steering learning process to happen rapidly. Worst case scenario, one can always heave to for a breather. There doesn't seem to me to be any good reason to not think about self steering while getting ready to put to sea. I've done enough heaving, too, to know that avoiding preparation is not the romantic scenario that books and movies would have us think. My son went camping in the Grampians without adequate preparation. I had an 18 hour round trip yesterday to retrieve him and his vehicle, and his mate who he called first to rescue him, and his vehicle. So he isn’t self-steering yet, eh Phil? The young ones these days are a bit vane. edit: sorry Bruce, I should leave the puns on the other thread. But it was just there. Last edited by Geftb; 04-17-2019 at 10:13 PM. The dog sitting is done and now I'm free to travel. Tuesday and Wednesday still look good for a first overnighter. 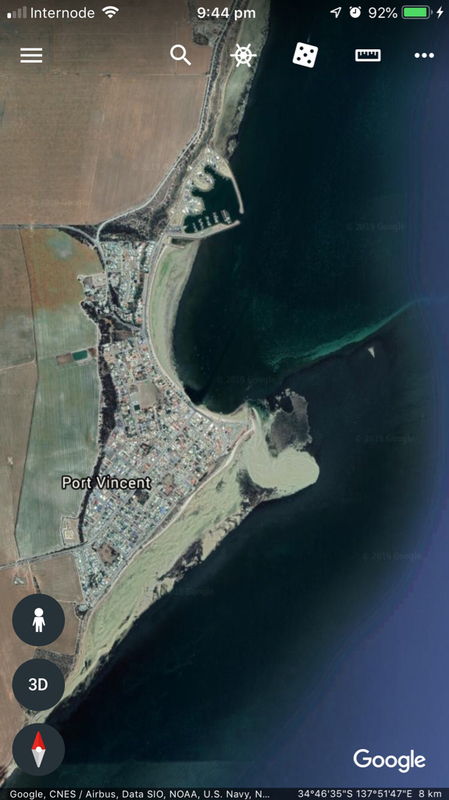 I'll probably go to Port Vincent instead of Sheoak Flat to take a bit of shelter from a light/moderate SSW Tuesday night. The batteries all seem to have come good. That's good. I'm taking three charged batteries for the VHF as I don't know how to rig up a charger from the boat. Got a new sleeping bag, and prepped the cooking gear and coffee maker. When we used to cruise our Tumlare we fitted a tiller pilot. Had a small solar panel and a small car battery. We'd go to sleep as we passed the fairway beacon and wake up as we approached the Orontes bank. Sometimes I'd pop my head up for a look around along the way. Tuesday and Wednesday are looking perfect. Broad reach both ways. Write us a poem while your out there if you feel inclined. Bruce, in my little sloop I have a deep cycle battery, charge it when I'm home, and have a little 200 watt inverter hooked up to it. It seems more than adequate to keep the VHF, Phone and Lappy charged up, I've been away for two weeks at a time and have yet to run the 80 amp hour battery flat. As far as I can tell the only real needs are coffee, sleeping bag and something waterproof over the sleeping bag. So as usual I'm overkilling it. If winter doesn't actually come, which looks likely, I may even get a two nighter in next week. Winter? It's not even going to rain until mid May. And then only lightly. Looking forward to the story...and the photos. It might be a different story to the one I've planned. The wind came up to 19-23 knots this arvo despite an earlier forecast predicting less. Tomorrow and Wednesday may be similar and I don't really want to do a stress test in the middle of the gulf this early in the grand scheme. I may end up doing a local escape up into the Port River for a countery at a good pub and a camp out up in the Port.